There’s been a few films about AI recently (I blogged about Ex Machina not very long ago), as well as some popular science type discussion (e.g. in New Scientist – I particularly like the article by Mark Bishop, called ‘Fear Artificial Stupidity not Artificial Intelligence’), and Chappie is yet another. The interesting thing about Chappie is that the AI programmer is searching for the coding for ‘consciousness’. I mean, have we even figured out what consciousness is yet? Anyway, having found this consciousness code, he breaks all of the rules of the business he works for and goes on to install it in a broken robot, with the assistance of a gang of thugs that hijack him. I still wonder in what way the robot Chappie can be seen to have consciousness. Is it because the robot is aware he is a robot? Does self-awareness equate with consciousness? Is it because he has to learn and grow like humans, becoming conscious of his surroundings only as he interacts with them? Is there even such a thing as consciousness? Scientists still dispute what consciousness is – a state of being, or what? The developmental stage of Chappie’s existence throws light back on the development of humans: I’m sure it’s a critique of the ways in which some children are brought up, with the normalisation of drugs, weapons and violence. The gang do their best to lead Chappie astray, but as he has promised his ‘maker’ Deon (the programmer) that he will not do anything illegal, he is lied to by the gang to persuade him to help them in their illegal pursuits. 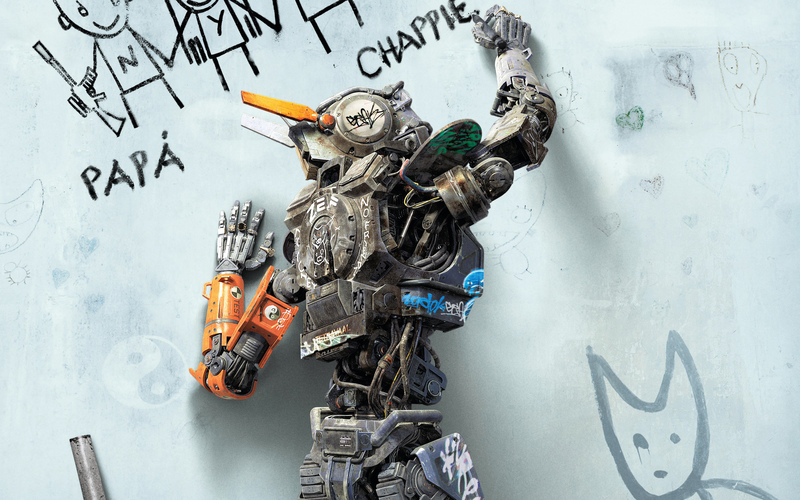 Chappie comes across as a vulnerable (and gullible) child, easily coerced and oblivious to the truth. Chappie is just like any child, eager to please his role models, emulating their behaviour, and learning from them. Back to the consciousness thing, though. The film suggests that what makes us us is our consciousness. The fact that *major spoiler alert* in the end his ‘consciousness’ and Deon’s can be transferred out of their broken bodies and into new robotic ones, means that they still exist as beings. OK, so Chappie has gone from being a conscious robot to being a different conscious robot, but Deon has changed from a conscious human to a conscious robot. Is Deon still Deon? In what way is he Deon without his human body? Does ‘Deon’ exist just in a serious of codes that can be transferred from one computer to another? Or has Deon really died and the robot now thinks it is Deon because it has managed to code all of his thought processes and memories into data and it has been transferred to the robotic computer? I am inclined towards this latter perspective, as I agree overall with the point made by Bishop in the New Scientist article I mentioned above. I don’t think computers will ever have the same functionality as the human brain in terms of consciousness. I don’t think all of the ‘cognitive faculties’ (as he calls them) of humans will ever be achieved by robotic machinery. I’m not saying this because I think human cognitive faculties are somehow beyond science or beyond replication, I just don’t think computers will ever be as inconsistent or as creative as human beings are. I think they will only ever be rational, and to that degree, I think they will always in some way be stupid.